ICJ Advisory Opinion on the Separation of the Chagos Archipelago from Mauritius in 1965. The International Court of Justice issued an Advisory Opinion today in respect of the Legal Consequences of the Separation of the Chagos Archipelago from Mauritius in 1965. Click here for the Advisory Opinion. Vice President Xue Hanqin of China and Judges Peter Tomka of Slovakia and Ronny Abraham of France added declarations to the Advisory Opinion, as did Judges Kirill Gevorgian of the Russian Federation, Nawaf Salam of Lebanon, and Yuji Iwasawa of Japan. Judges Giorgio Gaja of Italy, Julia Sebutinde of Uganda, and Patrick Lipton Robinson of Jamaica appended separate opinions. Judge Augusto Cançado Trindade of Brzail also added a separate opinion and additionally joined a joint declaration with Judge Patrick Lipton Robinson of Jamaica. Judge Joan E. Donoghue of the United States appended a dissenting opinion. This blog is an Amazon affiliate. 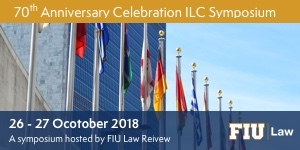 Help support International Law Prof Blog by making purchases through Amazon links on this site at no cost to you. Law Deans Roundtable at the ABA Section of International Law Conference.